OCCUPIED JERUSALEM, (PIC)– The Israeli occupation forces on Friday evening kidnapped a 20-year old young man in Silwan district and physically assaulted him using a stun gun. Director of Wadi Hilwa center Jawad Siyam said Israeli soldiers brutally attacked Mohamed Zeitoun without reason. Siyam added that there were no confrontations of any type between Palestinian young men from the district and Israeli soldiers. “He was beaten brutally for long minutes and then electrically shocked prior to his arrest,” he affirmed. He noted that following the incident, different popular committees in Silwan started looking for the whereabouts of the young man, especially as he was kidnapped by Israeli soldiers and not policemen. New York, Sep. 29 (Petra) — Foreign Minister Nasser Judeh, reiterated Jordan’s position on Syria, saying the tragic situation in the country must stop. Judeh spoke at a meeting of foreign ministers of the friends of Syria, which took place in New York on the sidelines of the general debate of the UN General Assembly. He said there is no alternative to end the conflict but a political solution that would end the bloodshed, return peace and security to the towns and neighborhoods and preserve the unity of Syria. Judeh said Jordan will continue to support the mission of UN Envoy Lakhdar Ibrahimi. He said Jordanian Syrian relations are historic, adding that since the outbreak of the crisis Jordan has provided refuge to over two hundred thousand Syrians. The minister also took part in a G8 Deauville Partnership with Arab Countries in Transition meeting and highlighted the group’s importance in supporting the capabilities of Middle East governments after the Arab Spring. He spoke about Jordan’s efforts to bring about comprehensive reform in various walks of life. Judeh also met with the foreign ministers of Azerbaijan, Malta, Armenia and Singapore and discussed them efforts to achieve peace in the Middle East. Palestinians in the West Bank city of Nablus demonstrate in solidarity with hunger striking prisoners, July 2012. Palestinian human rights groups Addameer and Al-Haq today issued a statement of concern over the life of Ayman Sharawna, who is on his 88th day of hunger strike in Israeli prison. Sharawna has been held without charge or trial — a widely condemned practice known as administrative detention — since he was arrested in January, only a few months after his release during last year’s prisoner exchange deal. In response to the refusal of the Israeli authorities to release him and to further escalate his strike, Ayman decided to stop drinking water for five days from 16-20 September, during which time he lost seven kilograms in weight. The deterioration in his health includes loss of sight in his left eye and the loss of all feeling in his right leg. As previously reported, Ayman has already lost 80 percent of his vision in his right eye, which means that Ayman has become almost totally blind. He continues to suffer from severe kidney problems and has begun to suffer from partial memory loss. Ayman also continues to suffer from pain in his back, which remains untreated as the Israeli Prison Service (IPS) has said it will only give him pain relieving medication if he ends his strike. According to Adv. Ziad [Addameer’s attorney], Ayman did not want to start drinking water again but reluctantly did so out of fear for the deterioration in his health, particularly with his loss of eyesight and feeling in his legs. If he is not released, Ayman has declared that he will once again refuse water starting this Friday, 28 September. Ayman was re-arrested in January after being released in the prisoner exchange deal in October 2011. He is currently held without charge and the military committee has not yet reached a decision regarding whether or not Ayman will be returned to his prior sentence. Sharawna is the remaining known hunger striker in Israeli prisons after Hassan Safadi andSamer al-Barq suspended their months-long strikes after an Israeli military judge ruled that Safadi’s administrative detention order would not be renewed and after Egypt reportedly agreed to accept al-Barq if he is released and deported by Israel. salute the courageous hunger strikes of Hassan [Safadi] and Samer [al-Barq] and hope for a just resolution to Ayman’s case as soon as possible. Nevertheless, while the potential release of Samer from administrative detention should be welcomed, Addameer and Al-Haq are obligated to highlight their concerns with aspects of the proposed agreement that are fundamentally at odds with international law. Samer’s proposed release is conditional on his deportation to Egypt. Former administrative detainee Hana al-Shalabi was forcibly transferred to Gaza after her 43-day hunger strike earlier this year, separating her from her family in the occupied West Bank. Samer al-Barq’s story is one that involves injustice at every turn, as Shahd Abusalama reported for The Electronic Intifada earlier this month. Al-Barq was a science teacher living in Pakistan when he was arrested there in 2003 and,according to testimony given to Amnesty International by al-Barq’s brother, Samir, handed over to the US authorities. According to Amnesty, Samer al-Barq was “in a secret prison in an unknown location outside Pakistan,” where al-Barq alleges he was subjected to torture. Al-Barq was later detained in Jordan without charge or trial and denied contact with his family, according to Amnesty. He was handed over to Israel in April 2010, where he has been held in administrative detention ever since. The election is the first time Palestinians will have the opportunity to cast votes since 2006. BETHLEHEM (Ma’an) — A new poll shows 72 percent of Palestinians plan to vote in elections taking place in three weeks, but supporters of Hamas are much less likely to participate in the vote, which is being boycotted by the party. In a poll published on Saturday by the Arab World for Research & Development, 85 percent said they support holding local elections, which will take place on Oct. 20 in the West Bank only. The election is the first time Palestinians will have the opportunity to cast votes since 2006, after Hamas and Fatah split violently a year later. While a 2011 reconciliation deal envisaged fresh elections, in July Hamas called off electoral registration in Gaza at the last minute, citing repression of its West Bank members, and slammed Abbas’ Fatah-dominated government when it said it would proceed with the vote. The AWRAD poll found that 88 percent of Fatah supporters intend to vote, while only 54 percent of Hamas supporters say they will, and 56 percent of unaffiliated voters. The largest proportion of people planning to vote who say they support Fatah is in Jenin at 67 percent, where the largest proportion of voters supporting Hamas is in Hebron at 17 percent. Hebron also has the lowest expected turnout at 62 percent, while the highest is in Ramallah, where 81 percent plan to vote. Lack of knowledge about the composition of electoral lists and their agenda, unfamiliarity with the candidates, and expectations of fraud and corruption were the top reported reasons for not participating. The survey found only 38 percent like the current list system, while 50 percent would prefer a system that allows for the election of individual candidates. Local councils in the West Bank will be elected using proportional representation, after a party reaches the threshold of 8 percent of votes. Rights activists have expressed alarm that 200 out of the 353 electorates in the West Bank will not be contested because only one list of candidates has been put forward. A majority in the West Bank, 54 percent, are dissatisfied with their current local council, and the highest dissatisfaction is in Jenin at 78 percent. The last round of local elections in the West Bank and Gaza were held in phases between 2004 and 2005. Most voters told AWRAD their top priority was the encouragement of economic investment and job creation, followed by lower fees for services, better health services, youth opportunities, schools and equal access to services regardless of family or party affiliations. Recent demonstrations in the West Bank against the rising cost of living were unlikely to impact the election, with 85 percent saying they would have no effect on the way they vote. The most important criteria for a political candidate was personal reputation and ethics, with 94 percent saying this was very important. Next in importance, at 90 percent, was being in touch with people’s needs, followed by professional competence at 80 percent. For 46 percent of voters, a candidate’s support for women’s rights is seen as crucial, while 43 percent highly value religiosity. Fatah leader President Mahmoud Abbas is the most respected leader to 39 percent of voters, the survey shows, followed by Hamas prime minister in Gaza at 14 percent. However 29 percent declined to name a Palestinian leader they respect. In his address to the UN General Assembly on Thursday, Abbas insisted that elections would go forward as planned, but he emphasized they would not serve as a substitute for reconciliation with Hamas. “Our people will continue to build the institutions of their state and will continue to strive to achieve national reconciliation to restore the unity of our nation, people and institutions via resorting to the ballot boxes, which will confirm our people’s pluralistic democratic choice,” Abbas told a UN summit in New York. AWRAD interviewed 1,304 Palestinians in six major West Bank cities between Sept. 21-23, 2012 for the poll. The margin of error is 2.5 percent. 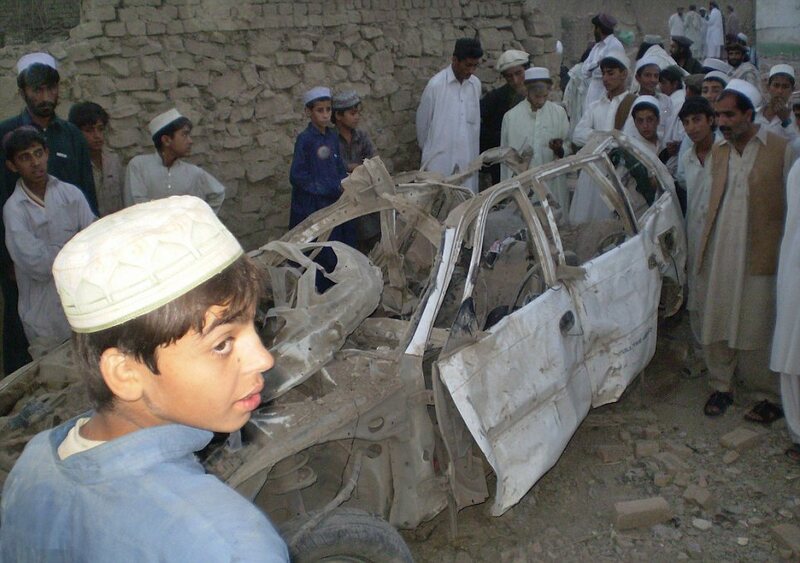 Just one in 50 victims of America’s deadly drone strikes in Pakistan are terrorists – while the rest are innocent civilians, a new report claimed today. The authoritative joint study, by Stanford and New York Universities, concludes that men, women and children are being terrorised by the operations ’24 hours-a-day’. And the authors lay much of the blame on the use of the ‘double-tap’ strike where a drone fires one missile – and then a second as rescuers try to drag victims from the rubble. One aid agency said they had a six-hour delay before going to the scene. The tactic has cast such a shadow of fear over strike zones that people often wait for hours before daring to visit the scene of an attack. Investigators also discovered that communities living in fear of the drones were suffering severe stress and related illnesses. Many parents had taken their children out of school because they were so afraid of a missile-strike. Today campaigners savaged the use of drones, claiming that they were destroying a way of life. There have been at least 345 strikes in Pakistan’s tribal areas near the border with Afghanistan in the past eight years. ‘These strikes are becoming much more common,’ Mirza Shahzad Akbar, a Pakistani lawyer who represents victims of drone strikes, told The Independent. The study is the product of nine months’ research and more than 130 interviews, it is one of the most exhaustive attempts by academics to understand – and evaluate – Washington’s drone wars. Despite assurances the attacks are ‘surgical’, researchers found barely two per cent of their victims are known militants and that the idea that the strikes make the world a safer place for the U.S. is ‘ambiguous at best’. Researchers added that traumatic effects of the strikes go far beyond fatalities, psychologically battering a population which lives under the daily threat of annihilation from the air, and ruining the local economy. They conclude by calling on Washington completely to reassess its drone-strike programme or risk alienating the very people they hope to win over. They also observe that the strikes set worrying precedents for extra-judicial killings at a time when many nations are building up their unmanned weapon arsenals. The Obama administration is unlikely to heed their demands given the zeal with which America has expanded its drone programme over the past two years. Washington says the drone program is vital to combating militants that threaten the U.S. and who use Pakistan’s tribal regions as a safe haven. The number of attacks have fallen since a Nato strike in 2011 killed 24 Pakistani soldiers and strained U.S.-Pakistan relations. Pakistan wants the drone strikes stopped – or it wants to control the drones directly – something the U.S. refuses. 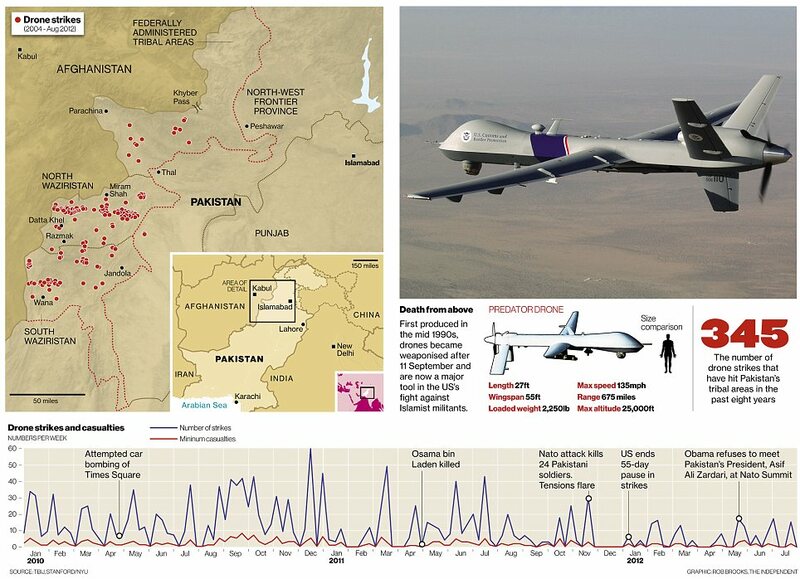 Reapers and Predators are now active over the skies of Somalia and Yemen as well as Pakistan and – less covertly – Afghanistan. But campaigners like Mr Akbar hope the Stanford/New York University research may start to make an impact on the American public. Today, Pakistani intelligence officials revealed a pair of missiles fired from an unmanned American spy aircraft slammed into a militant hideout in northwestern Pakistan last night. 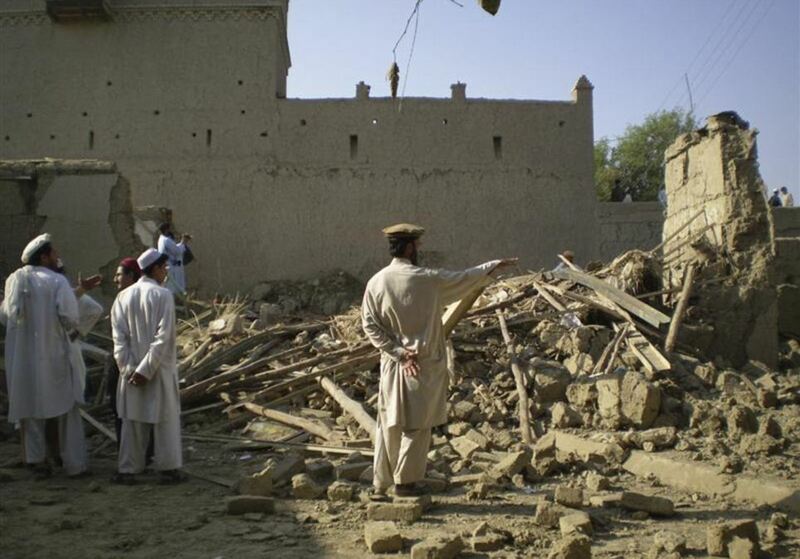 The two officials said missiles from the drone aircraft hit the village of Dawar Musaki in the North Waziristan region, which borders Afghanistan to the west. Some of the dead were believed to be foreign fighters but the officials did not know how many or where they were from. The Monday strike was the second in three days. On Saturday a U.S. drone fired two missiles at a vehicle in northwest Pakistan, killing four suspected militants. That attack took place in the village of Mohammed Khel, also in North Waziristan. North Waziristan is the last tribal region in which the Pakistan military has not launched an operation against militants, although the U.S. has been continually pushing for such a move. The Pakistanis contend that their military is already overstretched fighting operations in other areas but many in the U.S. believe they are reluctant to carry out an operation because of their longstanding ties to some of the militants operating there such as the Haqqani network. Syrian President Bashar al-Assad ordered the killing of two Turkish air force pilots who were captured after their fighter jet was shot down on June 22, 2012, files obtained by Al Arabiya show. As political tensions mount between neighboring Syria and Turkey, newly-leaked Syrian intelligence documents obtained by Al Arabiya disclose shocking claims shedding light on the dreadful fate of two Turkish Air Force pilots. Contrary to what was publically claimed, the documents reveal that the pilots survived the crash, but were later executed by the regime of Syrian President Bashar al-Assad! This disclosure is the first in a series of revelations based on a number of newly-leaked and highly classified Syrian security documents which will be aired in a special program produced by Al Arabiya over the next two weeks; the channel’s English portal – http://english.alarabiya.net – will be carrying a subtitled version of the program on daily basis as well as publishing downloadable copies of the leaked documents. The documents were obtained with the assistance of members of the Syrian opposition who refused to elaborate on how they laid hand on the documents. Al Arabiya said that it has verified and authenticated hundreds of these documents and that it is has decided to disclose the ones with substantial news value and political relevance. On June 22, a Turkish military jet was shot down by a Syrian missile in international airspace, Ankara’s official report said; a claim Damascus has refuted. Assad’s regime said the country’s defense forces shot down the two-seater F-4 Phantom as it was in the Syrian airspace. In an interview with Turkish paper Cumhuriyet published in July, Assad said he wished his forces did not shoot down the jet, claiming that Damascus did not know the identity of the plane at the time. The incident set off tensions between the former allies, but Ankara, which had vowed a harsh response to any border violations by Syria, limited its reaction to sending military reinforcements to the common frontiers. The two pilots on board of the jet were killed. But both official reports by Syria and Turkey have restrained their explanation on the causes of the deaths of Air Force Captain Gokhan Ertan and Air Force Lieutenant Hasan Huseyin Aksoy. Turkey’s armed forces said it had found the bodies of both pilots on the Mediterranean seabed. “The bodies (of the two pilots) have been recovered [from] the seabed and work is underway to bring them to the surface,” the army command said in a statement released early in July. The military did not specify where the bodies were found, but there has been no report that the pilots ejected from the plane. However, after investigating the leaked documents it obtained, Al Arabiya can now reveal for the first time an alternative narrative of what might have happened to the two Turkish pilots. The file therefore reveals two critical reports. First, the pilots were still alive after the plane had crashed. And second, that Russia held its share of involvement in this secretive mission. The same document orders the concerned parties to treat both Turkish pilots according to the protocol of war prisoners, as instructed by the president. It also requests that both men be investigated about Turkey’s role in supporting the Free Syrian Army (FSA), the country’s main armed opposition group. The report also suggests the possibility of transferring the pilots into the neighboring Lebanese territory, leaving them in the custody of Assad’s ally, Hezbollah. However, if the Turkish air commanders were not killed upon the crash of their F-4 Phantom, further leaked documents confirm that their death was inevitable. The document also suggests the Syrian government sends a “menacing” message to the Turkish government, insinuating Syria’s capability of mobilizing Kurdistan’s Workers Party (PKK) on the Turkish borders, notifying Ankara from the danger it might face in case of any hostile move. The report insists that the Syrian leadership should hasten and make a formal apology to the Turkish government for bringing down the plane, which would embarrass the Turks and win the support of international public opinion. As such, the Syrian Regime did apologize. Al Arabiya’s exclusive series on the newly-leaked Syrian security documents continues tomorrow. Het CIDI is bij de meeste mensen in Nederland bekend. Het traditioneel pro-Israëlische Nederlandse establishment beschouwt deze club als een gerespecteerde spreekbuis voor het Zionistische gedachtegoed, en geeft hen uitgebreid de ruimte te opereren als een pro-Israëlische lobby in het Nederlandse maatschappelijke en politieke bestel. In zekere zin kan het CIDI beschouwd worden als de zichtbare en hoorbare spreekbuis van het Israëlische regime in Nederland. Welke oorlogsmisdaden tegen het Palestijnse volk door dit regime ook maar gepleegd worden, het CIDI staat klaar om in de Nederlandse media, binnen politieke partijen en op universiteitsdebatten en andere publieke fora het Israëlische staatsterrorisme goed te praten, en zelfs neer te zetten als redelijk, menslievend, en geweld schuwend. Ondanks het feit dat het Zionisme inherent racistische elementen bevat die niet-Joden als inferieure wezens neerzetten, en dit in de dagelijkse praktijk van de Israëlische staat door middel van geïnstitutionaliseerde Apartheid ook in de praktijk brengt, blijft het CIDI een van de meest actieve en succesvolle groeperingen die in staat blijken te zijn het Zionisme als acceptabele ideologie te presenteren. Maar er is meer. Deze organisatie doet immers ook haar best om in de Nederlandse publieke arena op te treden als spreekbuis voor de Joodse gemeenschap, en wordt door velen – maar niet allen – ook als zodanig ontvangen. Binnen dit kader is er volgens het CIDI een voortdurende toename van antisemitisme in de maatschappij, ondanks aanwijzingen dat er juist sprake zou zijn van een afname. De laatste jaren heeft het CIDI zich bovendien ook toenemend ingespannen om zichzelf te profileren als organisatie die zich in het algemeen inzet tegen discriminatie, door toenadering te zoeken en banden te smeden met organisaties van gediscrimineerde groeperingen in de maatschappij. De organisatie slaagt er hiermee in opkomende geluiden van anti-Zionisme (een beweging die de volledige gelijkwaardigheid van Joden en niet-Joden nastreeft en ook Joodse voorstanders heeft, zoals je elders op deze website kunt zien ) die door de historisch pro-Israëlische houding van het Nederlandse establishment slechts met moeite voet aan de grond krijgen, de kop in te drukken. Het is van belang om dit aan de hand van enkele voorbeelden te illustreren. In 2006 werd het JMNA opgericht, het Joods-Marokkaans Netwerk Amsterdam, en was het CIDI een van de mede-oprichters. Onder de vleugels van Job Cohen werd dit netwerk opgezet om zich te verzetten tegen “uitingen van antisemitisme, islamofobie of andere vormen van discriminatie”, zoals in het startdocument duidelijk te lezen is. Op zichzelf een zeer nobel streven, uiteraard, maar je moet wel kijken met wie je hiervoor in zee gaat. 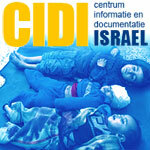 De Marokkanen die de deelname van het CIDI aan deze activiteit accepteerden (zie het startdocument) lieten hier eigenlijk al mee zien het CIDI – en daarmee het Zionisme – als acceptabele partner te beschouwen in de strijd tegen discriminatie. De inherente tegenstrijdigheid van deze manier van denken is uiteraard overduidelijk, maar zou wellicht nog beter geïllustreerd kunnen worden door het maken van een analogie. Is het denkbaar dat een Nazistische organisatie zich zou aansluiten bij een samenwerkingsverband tegen racisme? Zouden ze bijvoorbeeld welkom zijn op een Anne Frank-bijeenkomst, in een poging om hun ideologie op huichelachtige wijze neer te zetten als ‘niet anti-Joods’? Wat de meeste Nederlanders betreft terecht niet, maar om dezelfde reden is het toelaten van een Zionistische organisatie binnen een andere context van anti-discriminatie evenzeer onaanvaardbaar, omdat het hen de mogelijkheid biedt het racistische karakter van hun ideologie wit te wassen. Toch werd dit samenwerkingsverband aangegaan, en is het JMNA tot op heden nog steeds actief. Dat het voor de betreffende leden van de Marokkaanse gemeenschap hierna onmogelijk blijkt nog een grens te trekken tussen het aanvaardbare en het onaanvaardbare ligt sterk voor de hand, maar wordt ook verder geïllustreerd doordat de stap naar gezellige feestjes met deelname van de Israëlische ambassadeur Haim Divon en de bekende Zionist Rabbijn Evers dan nog maar een heel kleine is. Een en ander is op deze website al eens eerder onder de aandacht gebracht, waarbij Fatima Elatik in deze bedenkelijke context op de foto te zien is. 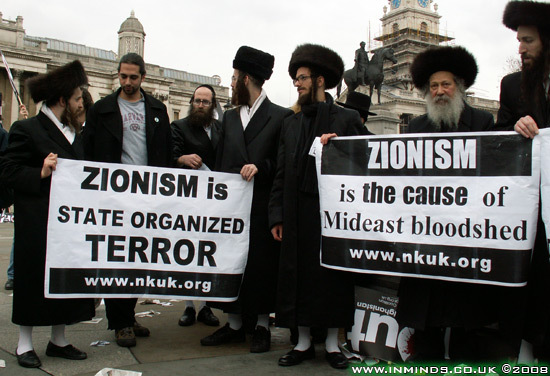 Zij zou toch beter moeten weten, denk je, dan met vertegenwoordigers van de Zionistische staat te poseren? Als normvervaging eenmaal toeslaat, baant het echter duidelijk de weg voor meer van hetzelfde. Normalisatie heet dat dus. Een recenter voorbeeld van CIDI-activiteit op het gebied van anti-discriminatie is het anti-racisme evenement van anti-Zwarte-Piet activist Quinsy Gario, “Stop Racism! Celebrate Unity”, dat op 21 maart 2012 in Amsterdam werd georganiseerd. Uiteraard slaagde het CIDI er opnieuw in om zich als anti-racistische groepering neer te zetten, dankzij de goedgelovigheid en ongeinformeerdheid van de overige betrokkenen. Spreekster Esther Voet werd uitgenodigd om namens het CIDI het woord te voeren over ‘hun strijd tegen discriminatie en uitsluiting in Nederland’, tegelijk met vertegenwoordigers van onder andere het COC, Contactorgaan Moslims en Overheid en Zwarte Piet is Racisme. Het feit dat deze andere organisaties het CIDI – juist in een dergelijke context – als partner tolereerden kon geen sterkere witwassing zijn voor het Zionisme. Alweer werd de wolf in schaapskleren in staat gesteld zich tussen de schaapjes tegen het geweld van ‘andere’ wolven uit te spreken. Een kritisch stukje op Wijblijvenhier, waarin het behalve Quinsy ook Rajae el Mouhandiz werd verweten dat ze zich niets aantrok van de deelname van een racistische organisatie aan een anti-racisme evenement, was slechts een pleister op een voortdurend pussende wond. Dat het CIDI zichzelf inmiddels als geaccepteerd mag beschouwen in anti-racisme kringen, werd echter zelden sterker onderstreept dan door de deelname van Mohamed Rabbae aan een vergelijkbare manifestatie tegen discriminatie, dat op zondagmiddag 30 september zal worden gehouden in de Amsterdamse Westerkerk. Het CIDI is hierbij weer van de partij, geheel in overeenstemming met het hen door de voorgaande gedogers aangereikte imago van ‘anti-discriminatie-groepering’. Mohamed Rabbae staat bekend als iemand die zich vaak in het openbaar kritisch heeft uitgelaten over de Israëlische bezettingspolitiek. Toch blijkt hij er geen probleem in te zien het CIDI te accepteren als partner in een anti-discriminatie-activiteit, ondanks het feit dat hij desgevraagd zegt geen hoge dunk te hebben van het CIDI. Ook houdt hij vol dat hij niet samenwerkt met het CIDI , ondanks het feit dat zijn naam samen met CIDI-leden ook terug te vinden is in het eerder genoemde JMNA-startdocument. De onderzoeker van het CIDI die in de Westerkerk-bijeenkomst meedoet, zo stelt Rabbae, is door de Joodse Liberale Gemeente naar voren gebracht, en kon om deze reden niet geweigerd worden. Hij is het er echter niet mee eens dat hij door deze voortdurende witwassing van het CIDI bijdraagt aan de normalisatie van het Zionisme, en daarmee dus van een hardnekkige vorm van tot op staatsniveau geïnstitutionaliseerd racisme. Het is buitengewoon desillusionerend dat iemand zoals Rabbae zich hiervoor laat lenen, temeer omdat het in zijn geval niet goedgepraat kan worden onder het mom van gebrek aan informatie. Als het inderdaad zo is dat Rabbae kritiek heeft op de Israëlische politiek maar desondanks respect op weet te brengen voor het Zionisme, een racistische ideologie die dit racisme op bloederige wijze tastbaar en voelbaar maakt door de praktijken van etnische zuivering jegens het Palestijnse volk, dan moet ik het misschien mezelf maar eens beginnen te verwijten dat ik me in hem heb vergist. Ik heb immers meermalen met hem deelgenomen aan activiteiten tegen racisme en tegen het geweld van de Zionistische staat. Misschien is het inderdaad zo dat zijn gedachtenwereld nog steeds gevangen zit in de misleidende Oslo-dynamiek van ‘twee volkeren die allebei welwillend zijn maar het niet eens kunnen worden over de verdeling van grondgebied’. Een gedachtegoed dat voorbijgaat aan de etnische zuivering van 800,000 Palestijnen in 1948 ten behoeve van de stichting van een Apartheidsstaat, die de Joden als ‘uitverkoren volk’ exclusieve rechten verleent ten koste van de oorspronkelijke bewoners van het land, en op steeds verdergaande wijze zijn racistische politiek van onderdrukking en uitsluiting op de Palestijnen uitstort. Het CIDI is, evenmin als aanhangers van vergelijkbare gedachtestromingen zoals Nazi’s, KKK of andere racistische groeperingen, die de ene mens boven de andere verheffen op grond van afkomst, cultuur of ras, geen acceptabele partner in de strijd tegen discriminatie. Wie hen op een dergelijk podium toelaat maakt zich schuldig aan het witwassen van keiharde racistische politiek en Apartheid. Het afwijzen van de Israëlische bezetting maakt je nog geen strijder tegen racisme. Dat is immers het minimum waar iemand die respect heeft voor het internationaal recht zijn handtekening onder zou moeten zetten – al zal het CIDI dat uiteraard nooit doen. Het werkelijke probleem is niet de Israëlische bezetting, maar de racistische ideologie die zowel de eerder genoemde etnische zuivering van de Palestijnen op zijn geweten heeft, alsook deze met het internationaal recht in strijd zijnde bezetting. Deze ideologie heet Zionisme, en is in Nederland als sterkst vertegenwoordigd door het CIDI. Dat het Zionisme zich in weerwil van al zijn bloedige wreedheid en landdiefstal jegens niet-Joden probeert voor te doen als menslievende beweging die met iedereen het beste voorheeft, kennen we al via de huichelachtige woorden van oorlogsmisdadigers als Netanyahu, Ariel Sharon, Shaul Mofaz en Shimon Peres. Als je het jezelf toelaat Zionisten bij deze vermomming een handje te helpen door hen de kans te geven zich als discriminatiebestrijders voor te doen, sla je een figuur als modder in de strijd voor gelijke rechten van de mens. Waarvan akte. Gaza, Sep.29(Petra)– A Palestinian young man was killed and another was wounded when Israeli troops opened fire on Friday at Palestinian fishing boat northern the Gaza Strip. Palestinian sources said that 22 -year-old Fahmi Salah Abu Ryash died early Saturday, succumbing the wounds he sustained by Israeli fire. President Mahmoud Abbas addresses the 67th UN General Assembly at the UN headquarters Sept. 27, 2012. BETHLEHEM (Ma’an) — Israeli leaders condemned President Mahmoud Abbas’ remarks to the UN General Assembly on Thursday, describing the speech as “incitement” and “slander” and against Israel. In mid-September Israel transferred over 100 million shekels in tax revenues to the Palestinian Authority, which is facing a fiscal crisis. The transfer was sent two weeks early in light of the crisis. Israel’s Haaretz newspaper said Prime Minister Benjamin Netanyahu was “furious” and expressed anger about the speech. He said Abbas should have mentioned the tax revenue transfer. In his UN remarks, Abbas accused Israel of working to weaken the Palestinian Authority. “Israel’s overall policy is ultimately leading to the weakening of the Palestinian National Authority, undermining its ability to carry out its functions and to implement its obligations, which threatens to undermine its very existence and threatens its collapse,” Abbas said. The Israeli prime minister has opined that the recent Muslim protests against an anti-Islam movie are the act of the “medieval” forces of radical Islam. Benjamin Netanyahu, who was trying to show an apocalyptic picture of Iran’s nuclear energy program, admitted that Iran does not have a nuclear weapon. Press TV talks with Gordon Duff, senior editor of Veterans Today from Ohio, regarding the issue. What follows is an approximate transcript of the interview. Press TV: Firstly, I wanted to ask you about what the Israeli prime minister spoke about as being the “medieval forces” of radical Islam versus the “modern forces”, as he described them. I would like to get your reaction to that if I may. Duff: It is unusual hearing someone as radical and extremist as Netanyahu talk about others. The reactions in Islam were carefully orchestrated by Israeli forces that produced the films, released them, led the attacks and the attacks against the US consulate in Benghazi were, we believe, stimulated, paid for and organized by Israel’s Mossad and they had nothing to do …; as a matter of fact, they were planned months in advance and orchestrated carefully with the release of the movie. Press TV: Mr. Duff, I also wanted to talk about of course Iran, something that Benjamin Netanyahu spent a significant amount of time on and he had a chart and everything. What is your opinion on his entire talk about Iran? Duff: Two days ago, Netanyahu received a letter from Clinton Bastin, a 40-year lead nuclear weapons developer for the US Department of Energy; the lead consultants for the IAEA. I saw a receipt from that letter that President Netanyahu received the letter … told him that Iran’s nuclear program using uranium Hexa-fluoride (UF6) gas would never be able to produce nuclear weapons and that his rhetoric had been utterly false. The IAEA letter that he received is totally the opposite of the statements that were made, meaning that every word that he said was in disagreement with the letter he received from the IAEA; every word was a lie. Even worse than that, the statement that he made in front of the United Nations is exactly almost word for word the same statement he made in 1992. Press TV: After that speech, Israeli officials have said that Netanyahu’s speech should convince the world about this “red line” that Israel wants. Do you believe that it will? Duff: All that Netanyahu has managed to convince is he has convinced the people of the United States that he is attempting to interfere in our election; we resent it. People here and people I talk to around the world, people I talk to in Israel believe that Netanyahu has become mentally unstable and he needs to be removed from office and perhaps hospitalized.